The Medline Hospital Bed is Lighter, Easier, Stronger and Safer! The Medline Semi-Electric Hospital Bed is the lightest bed on the market weighing only 137 lbs. Smooth rolling, 3" casters make the Medline Bed very easy to move. Two of the Medline Hospital Bed casters have top activated brakes to lock the bed in place for added security and peace of mind. Medline Hospital Bed electronics and motors are washable with standard water pressure. Plastic Medline Bed end panels are easy to wipe down and keep clean. Medline Beds can be easily transported without removal of the motors. Medline Beds have a 450 lb. weight capacity with an extra steel plate welded to the middle of the frame. Plastic Medline Bed end panels resist breakage while the heavy duty Medline Hopsital Bed remote resists breakage and moisture. Medline Bed frame is painted with three coats of enamel and clear coated to provide a strong finish that is chip and scratch resistant. Medline Beds feature quiet DC motors that keep patients and caregivers safe with a low voltage system that is also washable. Medline Hospital Bed headspring supports are moved out of the way to resist pinching and injuries. Medline Bed foot assembly hinges are also placed inside the frame to significantly reduce any chance of pinching. The Medline Semi-Electric Hospital Bed includes a lifetime warranty on frame and welds as well as any product defect for the original consumer. A three year warranty covers all other parts of the Medline Semi-Electric Hospital Bed. Lightest bed on the market at 137 lbs. Smooth 3" casters with two top activated brakes. Sealed durable Medline Bed panels. Medline Bed motors are quieter, lighter and washable. New Medline Hospital Bed Remote is durable and moisture resistant. 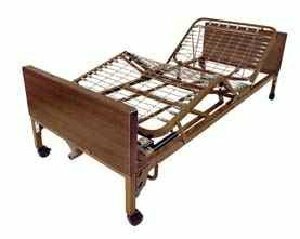 Quality, extra, steel plates and welding prevent sagging of Medline Beds.